From the sounds of a few of you on Twitter.... you've been waiting for this post from me haha! I had thought about writing a post as soon as the episode aired but then thought if I started I writing I may never stop and as time goes on I have had even more thoughts and questions to get through so I've sat down today to let it all out! 8am Wednesday morning marked the end of a 5 year question I've had buzzing around in my brain. Who the bloody hell is 'A' and why are they doing this?! So I'm going to go through my thoughts about the BIG A reveal, my predictions and if they were right, my honest opinion and a 'few' questions I still have playing on my mind! And.... I knew that Sara Harvey was trouble - I thought maybe she was Bethany but I did have an inkling she'd be red coat! As soon as she said "I'm calling Tanner" I knew she was on the A team! Obviously I did have Wildern and Wren at the back of my mind... like everyone else and I did think Melissa would maybe have something to do with it or someone may have had a sneaky twin but you never know... we still have a season and a half to go! So, when I first watched the episode there was a lot of "I knew it" "huh?" "what?" "really? "'s coming out of my mouth and going round in my head! Yes! I had gotten it right Cece was A.... but Sara as Red Coat AND Black Widow?! Bethany IS actually dead... Mona had been the one to hit her AND she was the one who pushed Marion. I mean... it was a lot to take in and some things just didn't sit right with me (but we'll get to that in a minute)! That crazy screen the girls watched everything on - what is this? Star Trek?! Cece is cray. "But did you die?" - I couldn't stop laughing at this! Seriously girl - WHY are you doing this?! Mona's awesome one liner - "Aria maybe you thought Clark was always happy to see you but I couldn't get past the buldge in his pants"
THAT DAMN WINDOW SCREEN! Cece watching the girls through the window.... but really just watching a scene from Season 3? on a screen - hahahahaa! Great attempt guys! Emily punching Sara - YOU GO GIRL! The girls saying bye to each other obviously got me all chocked up - Spencer saying "Hanna Banana" - ALL THE FEELS and no matter how I feel about the finale the flash forward has got me SO excited for January!!! I literally couldn't stop thinking about the episode all day... and that was the problem... the more I thought about it the more I thought - wait a minute? Really?! That doesn't even make sense! I'm not mad that Cece is A - I mean I had guessed it already but it's just everything else inbetween that's got me a little - confused/frustrated/stressed. Do I take this show too seriously? 100%. Yes. You might need a cup of tea to get through the next 2 sections as I may ramble on for a bit! Now it's been 3 days since I watched the finale and I have been thinking about it a hell of a lot - reading tweets, tumblr, thinking about previous episodes and THERE ARE SO MANY UNANSWERED QUESTIONS! I just WISH I had been more shocked/surprised and blown away! It made me feel a little bit 'meh' - maybe because I had already thought it? But I just feel like if I was more tense and surprised by previous finales e.g. the dollhouse and the Ezra reveal! I love PLL, I love Marlene but I can't help but think that this wasn't always the plan - I mean maybe it was, but so much doesn't add up and there's been some incredible clues throughout the show which aren't anything to do with anything - so why have them!? WHAT was Sept 7th all about?! Sara knew the passcode for the Carissimi group - but why was it September 7th? Cece was 12 when Marion died. This makes no sense with the timeline we have already seen on the show. Toby tells Emily in season 1 or 2 that his Mum passed away 'a year ago last week'. Literally makes NO sense, it wasn't a flashback it was a real scene so there's no talking their way out of that one! WHAT does Bethany have to do with it all?! Jessica took her horse riding, she wrote letters to Alison (did they know each other?) and she had drawn all those photos of Mrs. D. etc - why was she such a big storyline if she is no-one? If Cece loved Ali WHY did she want to torture her?! Where the eff did Sara Harvey come from? Why was she so eager to help Cece if she didn't even know the girls?! How old was Wildern? He was a policeman already when Marion died? aka when Cece was 12.
Who killed Mrs. D? This one is seriously bugging me! And WHY did Cece text Ali bragging about burying her mum if she was so upset about it? Why were Radley not looking for Cece?! If a patient had escaped a mental institution you think someone at least would be informed right? If Ali could hear Mrs. D. talking when burying her then why couldn't she hear Cece? WHY did Cece want to create a prom that she never went too in the dollhouse? A prom that she was prom 'king' when she's been fighting to be a female her whole life. Why did Sara have to dress as Black Widow if no-one knew her? If the Doctors at Radley knew she was Cece then why did she have a visitors pass made for her by Wren? She went in her dressing gown from her room to Mona's - it doesn't make sense. In the end scenes the girls say "What happened to Sara that night wasn't our fault" - WHAT happened?! What happened to Cece after she came down from the roof? Is anyone going to tell Mona that she didn't actually kill Bethany and Melissa did when she buried her alive? What was Noel Kahn's secret? We've been told that 'A' is in the pilot.... can somewhere tell me when/where Charles/Cece is in that episode please. Was the N.A.T. club anything more than what we've seen? How did Jason see Melissa and Cece talking that night if Cece wasn't there in the yellow top? What did Aria whisper to Mona in the cinema that time? What happened to Tippi the bird? Who drugged Emily and took her to the cemetery? Was it Cece at Aunt Carol's house? That was never mentioned or addressed! Where did the boys go?! They were all at prom together and then... nothing! Why did Cece want to kidnap Mona and make her into Alison? What did the little girl in Radley have to do with the story? Why/How did Eddie Lamb recognise Aria? Why has no-one else ever mentioned Iceland? Only Aria has ever said they went to Iceland. Who were the twins hinted at this whole time? If Cece was in Radley whilst at college - how did she has a room mate? And... how was Cece prom queen if she never went to prom? Mona 'didn't' know about Charles.... but the anagrams of his name were found in her room? How does the Radley prank even make sense? Radley wouldn't have thought Cece was Alison but they KNOW Cece!? Why did Cece dress as red coat to 'help' Ali if she was 'A'? Why was Melissa helping Jenna and Shana? HOW AND WHY did a mental hospital let their patients out on the roof?! Radley knew Cece had escaped Radley that night... did they not think maybe she had something to do with her sister's diaperance? If Mona thought she had hit Alison wasn't she surprised to see her walkng along the side of the road? How did Noel know Ali was alive? And I think the number one question on everybody's lips - HOW did the mum's get out of the cellar?! See ya in January PLL lovers! I have been waiting for this post! You got all the same questions i did and so many more!!! Roll on January for some answers... hopefully!! Been waiting for your PLL post! I think all these questions unanswered, especially about Mrs D are meant to be unanswered. Maybe they'll come to light in 6B, maybe that's what Ali found out and why someone is coming for her which brings the girls back to Rosewood. That's what I think anyways! Haha! Too excited for January now! awesome post from a fellow PLL follower!!! 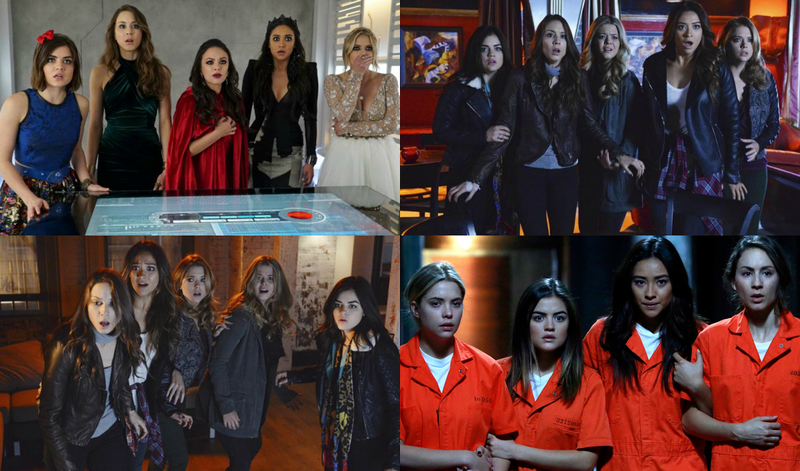 I finished watching PLL last night and I was kind of disappointed that A was CeCe, it was a bit anticlimactic! The story they used to explain why makes sense I suppose but because so many things are left unanswered I find it hard to believe that it was meant to be CeCe all along. Great post! Thanks so much for this post, I have some mixed feelings about the episode so it was nice to see them written down! I really hoped they'd answer more questions in the finale and tie up all the loose ends and explain why LITERALLY EVERYONE in Rosewood is so freaking suspicious. Sigh. I was really invested in some of the other characters from earlier seasons like Wren/Melissa/Lucas/Jenna/Noel and I thought that they would be part of the bigger story, I'm quite disappointed that they seemed to have vanished. Even though I wanted Wren to be A, I was on board with CeCe being A, I liked the transgender storyline and how she was rejected by her dad. But I think it could have been done better.They really should have given her some motivation to hate the girls as it feels like she just did it for fun - I mean these girls blinded Jenna, it would have been easy to have made them done something in the past that would give CeCe a valid reason to torture them. I thought that the Prom thing in the dollhouse could have been a flashback to a time when the girls did something awful... but apparently not. So apparently my original comment exceeds the character allowance XD, so I'm doing it in two parts! AHHH, SO EXCITED FOR THIS POST. I picked the whole Charles-is-transgender-aka-Cece thing several weeks beforehand, not because I had any actual proof, but because I was racking my brain trying to put a face to Charles, and after discovering that Charles wasn't Jason's twin (my main theory until then), I said to all the girls at work, "Look, what if Charles is transgender and A is actually CeCe? They do look like they could be sisters, after all!" "No!" my friends said. "That's crazy! They wouldn't do that!" Let me tell you, I swear it frickin' happens on US soaps all the time, soo... :D.
Cece was 12 when Marion died. This makes no sense with the timeline we have already seen on the show. Toby tells Emily in season 1 or 2 that his Mum passed away 'a year ago last week'. Literally makes NO sense, it wasn't a flashback it was a real scene so there's no talking their way out of that one! I think it's a genuine continuity error -- the show was originally only meant to go for three seasons at that point. WHAT does Bethany have to do with it all?! Jessica took her horse riding, she wrote letters to Alison (did they know each other?) and she had drawn all those photos of Mrs. D. etc - why was she such a big storyline if she is no-one? I personally thought that Mrs D. was trying to sort of 'bribe' her to keep quiet about Charles/Charlotte. If Cece loved Ali WHY did she want to torture her?! I don't know if it was ever explicitly said, but she's got antisocial personality disorder. I think she's a sociopath (i.e. created by her environment, rather than psychopath, which is genetically predisposed) and was at times saying some textbook sociopathic stuff -- so, y'know, there's why she loves despite wanting to torture. How old was Wildern? He was a policeman already when Marion died? aka when Cece was 12. I figured he was probably a fresh recruit at the time, so a lot younger (I think it takes a decent amount of time to make detective?) but, y'know, they kept the same guy. Who killed Mrs. D? This one is seriously bugging me! And WHY did Cece text Ali bragging about burying her mum if she was so upset about it? No idea re Q1, but I think Cece could've been having a socio moment re Q2. If Ali could hear Mrs. D. talking when burying her then why couldn't she hear Cece? Here I figure that perhaps Cece was crying more than talking, plus I don't think she was that close to the grave when Mrs D. was burying Ali. It's plausible that she couldn't have heard Cece. Why did Sara have to dress as Black Widow if no-one knew her? I was thinking about this for a while too, and I came to the conclusion that it could've been because she was a known missing person -- and I *think* they had been testing recently to see if the grave was her or not (but I can't quite remember). If the Doctors at Radley knew she was Cece then why did she have a visitors pass made for her by Wren? She went in her dressing gown from her room to Mona's - it doesn't make sense. It could be another continuity error, but I really think that Radley had the most incompetent staff members in the world. What happened to Cece after she came down from the roof? I'd just assumed she allowed herself to be arrested but who knows! :D Maybe something more exciting! Is anyone going to tell Mona that she didn't actually kill Bethany and Melissa did when she buried her alive? LOL hopefully not for a bit. How did Jason see Melissa and Cece talking that night if Cece wasn't there in the yellow top? I think it's doable, but I feel like we'd need to go back, re-watch the whole show and piece together a more complete timeline to see if it works. What did Aria whisper to Mona in the cinema that time? I think Marlene kind of answered this one time on Twitter, and said something about how it was just something really nasty. I think it was thrown into the show to be a red herring. Was it Cece at Aunt Carol's house? That was never mentioned or addressed! I think it was inferred. Where did the boys go?! They were all at prom together and then... nothing! I know! WHAT THEY DOING? Why did Cece want to kidnap Mona and make her into Alison? I think it's a sociopathic thing -- Cece was gleaming information from Mona at Radley, finding more about Ali, so she turned her into a substitute Ali. >Why has no-one else ever mentioned Iceland? Only Aria has ever said they went to Iceland. I never really thought there was anything more to Iceland than the fact that her family went there in the book, so they kept it. Who were the twins hinted at this whole time? Ali and Cece looked similar enough that they could pass as twins, so that would be it. Plus their mum bought them the same clothes. If Cece was in Radley whilst at college - how did she has a room mate? You're way better at remembering details than me LOL, but did we ever meet a roommate? If we didn't, I would call it a lie. And... how was Cece prom queen if she never went to prom? Another lie, I'd say. She was Prom Queen in her head. How are Mr. D and Jason doing? (Jason is probably scarred for life after dating his brother....) I think we'll find out in the second half! :D We have to, right? Why did Cece dress as red coat to 'help' Ali if she was 'A'? I think it was another way to be close to Ali. It was what she'd always wanted, so if Ali reached out for help, I think she'd have taken it. HOW AND WHY did a mental hospital let their patients out on the roof?! I can't imagine that the staff actually allowed them up there; I'm inclined to think that they were able to sneak out. Radley Sanatorium: Incompetent Since Opening. If Mona thought she had hit Alison wasn't she surprised to see her walkng along the side of the road? I would think so... But I would also think that she believed she had hit Ali until that moment, rather than hitting someone else. Ahaha, I can go on awhile, can't I? XD It just feels so good to discuss questions with another PLL lover! :D I never get much of a chance at work.